Well, considering I had already put everything together before lacquering, this step was dead easy. 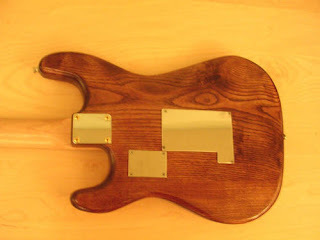 In fact, the hardest part was having the patience to wait for the lacquer to totally dry. I’d recommend waiting several days, or even a week or two if you can bear it. Be very, VERY careful with screws, screwdrivers, or any other item which might scratch your nice new finish. It was a wonderful experience making this guitar myself. I highly recommend it. You’ll learn a lot and you’ll get an amazing feeling of self-satisfaction when you put the whole thing together and play it. 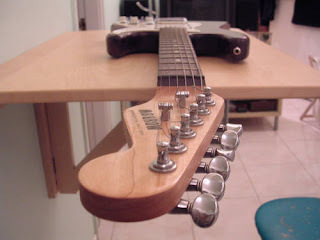 You should also take some time to set the guitar up right. 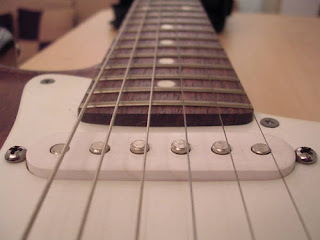 Intonation, string height and neck tension will all make a huge difference to how your guitar plays. 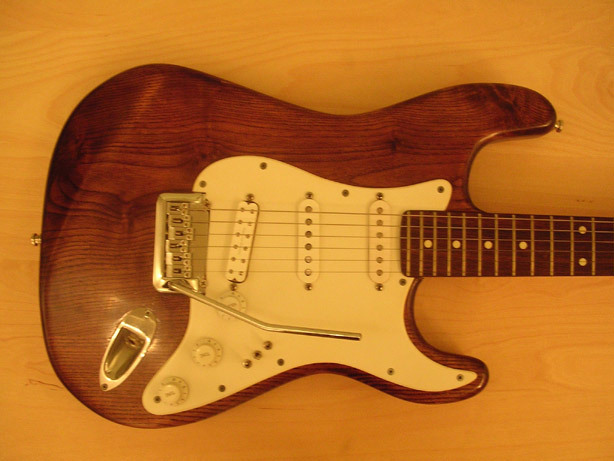 If you can’t set it up yourself, then consider taking it to your local guitar shop and paying a small fee for them to do it. I recommend learning to do it yourself though, but do be patient. It’s a learning process, so don’t expect to get it right first time. 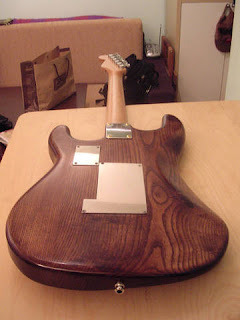 Here are a few more pics of the finished guitar from various angles. Enjoy. Please feel free to leave any comments or questions. I’ll be happy to reply.